This month we review two fundamental measurements with which we track the health of our business at Boat Trader. We’ll look at the number of unique visitors who came to Boat Trader in the first five months of 2013 and how many boat-listing pages they viewed. 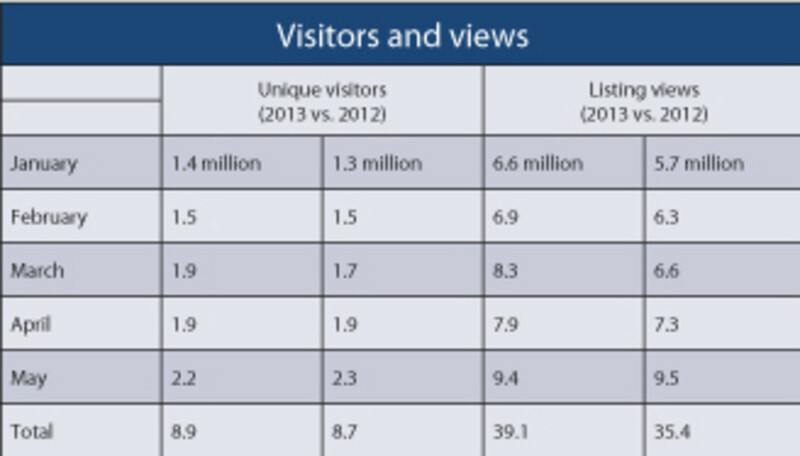 For the year to date the number of unique visitors to the site was higher or equal in four of five months and the same was true of boat-listings views. Seasonally, both numbers grew in 2013 by about one half from January to May, which also was the sole month that showed a decrease, though slight, in visitors and listing views. Taking the five-month period as a whole, the average number of boat listing views per unique visitor increased from 4.1 to 4.4, an increase that could be related to higher use of tablets and smartphones.